This past October 2017 I had the pleasure of presenting a Members-Only lecture for the Barnes Foundation. The presentation focused on Dr. Albert Barnes’ framing choices, how he made those selections, who provided them and the three American artist-framemakers he patronized. The archives at the Barnes Foundation is a treasure trove of information and includes Dr. Barnes’ extensive correspondence. (Happily the doctor’s letters were all typewritten.) That said, it was also a delight to see handwritten letters and even a frame-centric letterhead belonging to Robert Laurent. 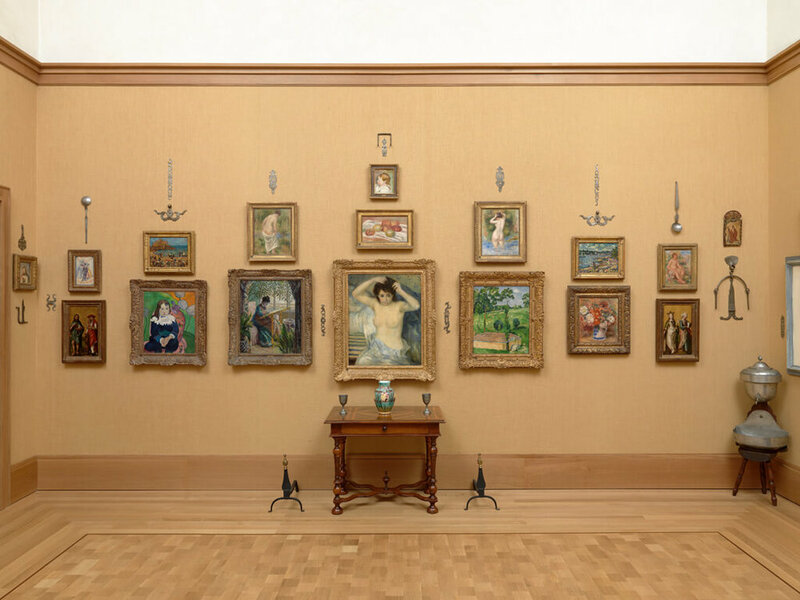 View of French Impressionist paintings in the Lehman Collection at the Metropolitan Museum of Art showing the taste for earlier French ‘Louis style’ frames. as well as the more restrained, Neoclassical Louis XVI style. A version of the latter was a molding so frequently utilized by Durand-Ruel that it became known as the ‘Durand-Ruel frame’. Referred to as a baguette frame, they are derived from Louis XVI French drawing frames. The moldings are a flat profile with a leaf tip or bead near the sight edge and a ribbon-and-stick pattern at the back edge. Detail view of Durand-Ruel ‘baguette’ frames in the Louis XVI style in the exhibition ‘Pictures by Boudin, Cezanne, Degas, Manet, Monet, Morisot, Pissarro, Renoir, Sisley. Exhibited by Messrs. Durand-Ruel and Sons of Paris’ at Grafton Gallery, London, January & February, 1905. 9420 typical Durand-Ruel ‘baguette frame’ in the Louis XVI style. Other variants employ a leaf tip at the back edge. In the Autumn 1977 issue of The Barnes Foundation Journal of the Art Department (Volume VIII, No. 2) Violette DeMazia wrote a lengthy article ‘What’s In A Frame’ that discussed the aesthetics of frame choices in detail; in it she wrote: “more and more as time went on he inclined towards the simplicity of the Louis XVI as best serving to set off the artist’s statement. There were, of course, other considerations as well that governed his selection of frames…balance on the wall with paintings already there, for one; the introduction of variety within that balance for another; the color of gold, the tone of the patina, etc. not to mention the aesthetic character of the carving, the proportions and such of the frame itself.” Indeed, many artworks hang in this restrained style. Ensemble showing the prevalence of the Durand-Ruel style frame. Barnes installed his growing collection in ‘Ensembles’ and this certainly influenced his frame choices. In the same article noted above DeMazia offers insight into Barnes’ ongoing and ever-changing process of installation that illuminates why today we see that a number of frames including those by artist-framemaker Charles Prendergast have been cut and rejoined to sizes other than the original with little or no attention to the integrity of the original incised corner ornament. Maurice Prendergast in a Charles Prendergast frame with incised sausage motif at corners. Detail showing another frame where the sausage motif is truncated due to cutting and rejoining. Barnes’ attunement to the subtleties possible in a gilded surface are in evidence throughout his correspondence with artist-framemakers Charles Prendergast and Max Kuehne. In conclusion, the thought and care Dr. Barnes lavished on the framing and presentation of his art collection should come as no surprise. From the detailed correspondence with his art dealers regarding not just the artworks but also their frames, to the avid patronage of American artist-framemakers, to his deliberative, complex and ever-changing Ensembles, Alfred Barnes’ singular vision served to create a collection unparalleled then or since and offers us nearly endless avenues to a deeper understanding of both the art he collected and the subtle yet profound effects of a painting thoughtfully framed. Posted on March 21, 2018 by Suzanne Smeaton and tagged Artist framemakers Albert Barnes Barnes Foundation French Louis frames Louis XV frames Louis XVI frames Impressionist Philadelphia Baguette frames Durand-Ruel Paul August Durand-Ruel Charles Prendergast Robert Laurent Max Kuehne Incised Gilded Gilder gilding Getty J Paul Getty Museum Ensemble.